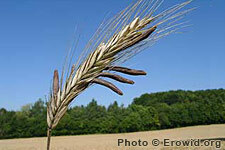 Ergot is a fungus that infects cereal grains, replacing kernels of the fruit with small black masses of mycelium. It produces ergotamine, a potent vasoconstrictor and precursor to LSD. Ergot poisoning (St Anthony's Fire) causes hallucinations, gangrenous loss of limbs, and death. Outbreaks plagued medieval Europe and were associated with witchcraft and the Inquisition. Is it possible to cultivate Ergot on Marijuana? Were the Salem Witch Trials drug induced?